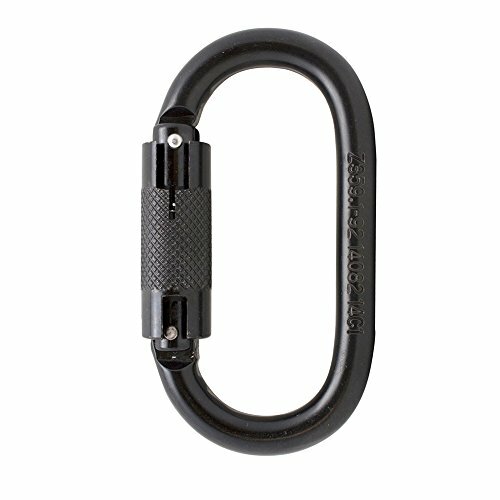 - Outer dimension: 4.25" x 2.4"
- This oval-shaped carabiner decreases the chances of cross loading the gate. Strong and versatile with an alloy steel body & auto-locking gate. - Auto-locking decreases the possiblity the user will forget to lock the gate and prevents the gate from unlocking from vibrations while working. - The oval design places equal amount of force in the spine and gate allowing the carabiner to maintain full rated strength regardless of the width of the web or rope clipped into it. - Sturdy forged design gives the user peace of mind when using the product. - It is easy to handle and clip with any pulley for climbing applications. - Available in gold and black.